Creating a Brand Name and Logo to Market Your Business - Smart Strategic Business Solutions, LLC. When starting a business or nonprofit organization, the creation of a good brand name and logo are crucial elements to the potential success of a business. The brand name and logo identifies the service or product your business will provide. They are also one of the very first things your potential client or customer will see. This is why it is necessary to be meticulous about coming up with the perfect brand name and logo for your business. This may seem like an overwhelming task, but this selection process requires careful consideration of what you ultimately want your company to be known for. After all, the brand name, along with the logo, sums up everything your business represents symbolically. Let us start out by discussing a few essential things to keep in mind when you decide on your brand name. First, let us start out by thinking about your story. Why are you starting this business? What drives you? What are you passionate about? These are just a few questions to keep in mind. Your brand name could potentially spark conversations or a discussion that can lead to you telling your inspirational story. All of these things lead to more customers relating to your business and ultimately spreading your story through word of mouth. For example, a young lady decides to name her photography business “Creating Memories.” Right away the name of the business signifies that she works to create memories through photography. The inspiration behind this business is the countless number of photos she took of her family throughout their lifetime that has created great memories. Her dedication and passion for her family could ultimately persuade a wavering customer to come her way because of similar passions. Imagine if she named the business “Simply Photos,” would customers have a similar reaction? Even though the name of the business does not include photography it is creating interest and it stands out amongst other photography businesses. She does not just take pictures, she creates memories. Next, for some companies, the brand name is the logo. According to Webster’s dictionary a logo is a symbol that is used to identify a company and that appears on its products. A logo is essentially the first thing a potential customer will see from your company. There is no one-way to create a logo, it could be a special font type, for others it is an image or symbol. When creating the logo you should also keep the brand name in mind. You want to make sure people can identify the logo with the brand name. The brand “Nike,” for instance, has a pretty straightforward logo in the shape of a check mark. This makes it simple for people to recall the business. Why? Instead of relying on solely the brand name, they are now also able to store the visual memory of the brand by associating it with the logo. Ultimately, the logo is an image that you want logged in your customers long-term memory. Next, keep it simple! A customer’s ability to pronounce your brand name goes a long way in their ability to spread the good news through word of mouth. Resist changing the spelling of common words in an effort to be creative. You want to make it easy for customers to find your business online and in directories. For example, although “Saucony” has become an effective brand name for athletic shoe apparel, it probably had some pronunciation issues when it first existed. People might have mistaken the pronunciation with the incorrect spelling. The company may have lost a significant portion of their potential customers just because these people could not correctly spell the brand name. So when it comes to ensuring that your brand can be remembered accurately, simplicity could be the best policy. Although simplicity is the best policy, you do want your brand name to stand out in a crowd, especially from other names in its category. 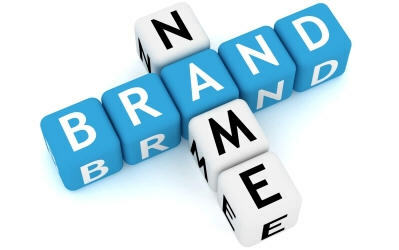 Brand names need to be memorable in order to create a buzz and generate an interest. It would be best to do some research on potential competitor’s brand names. This will assist in your process of creating a name that is equally good, but different. In other words, your brand name should stand out from the crowd of your closest competitors. A potential customer will most likely select a company that catches their initial attention. Additionally, make sure people like the brand name. This may seem simple, but this is often overlooked. Conduct small surveys; ask friends, family and colleagues. The more feedback you receive the better chance you have at creating a brand name that is likeable. Having a brand name that could be easily conformed to your web address could improve your chances of getting more traffic to your website. This is why it is key you choose a brand name that people could easily remember rather than something complex and meaningless. This will help when potential customers look for your business in search engines. Even if your company name consists of multiple words, creating a memorable acronym for the domain name is something you should keep in mind. Consider your business name being “National Home Experts of America” having a web address such as nationalhomesexpertsofamerica.com could potentially be difficult for consumers to find online. Changing to homeexperts.com could be easier and more memorable. With Facebook, Twitter and other social media platforms playing a huge role in the marketing success of businesses nowadays, it is important you do your due diligence. Make certain you check each social media site for pages with the same name. This will ensure there is no confusion of your brand and will easily allow people to find your business and gather more information. Another thing you should consider when selecting your brand name is your company’s email. Your email address will most likely resemble your brand name; so keep this in mind when you want your customers to use your email address as a way to communicate. For example “National Home Experts of America,” utilizing an email such as nationalhomeexpertsofamerica@hotmail.com could be complicated and confusing for customers. Thinking in the mindset of a consumer can help in creating consistency and simplicity. In conclusion, this process can be overwhelming at first, however; by utilizing the strategies of simplicity, distinctiveness, likeability and keeping in mind your story and logo, it should produce a rewarding outcome. The goal of this article is to empower you to think strategically in order to create a quality brand name and logo, which will ultimately enhance your overall company brand.